The fug in the compartment was thick, the conversation heated, and the night dark. When the tram jerked to a standstill, Jack found that he had travelled two stations too far and would have a five-mile walk through the snowbound countryside. As he trudged through the snow-drifts he happened upon a man lurching along the road ahead. The boom of Jack's rich voice as he hailed him brought the fellow to a gliding sort of halt, like a ship coming to rest at a quayside. Jack's heart nearly burst with love and pity. A flood of memories surged over him, and he linked arms with the boozer. The two men in the snow went rolling along the road together over the hills of South Yorkshire. ‘Mate,' said Jack, adopting his native North country way of talking, `seeing as how we're going the same way let me tell you som'at! `Worse than me.' gasped the man, pulling his arm out of Stoker's. The two, silhouetted against the snow clad countryside, looked slightly ludicrous - Stoker short, broad, beaming; the drunkard sagging at the knees, leaning back almost into the form of a human question mark. `Worse than me?' he repeated. `Do y'know, the night my Janie died left me desolate, defiant, wretched, mad, set on vengeance,' Jack went on. `I can't remember the funeral because I was too drunk the whole of that week, and for many a week after, to remember anything. The two men in the snow staggered on across the white landscape, the one absorbed in his terrible memories, and the other sobering fast under the spell of the story. `I used to go to my wife's grave,' continued Jack, `and get grass off it to carry in my bosom to have something of her near me. `Mon, you don't know what anguish is ! I've gone at midnight with an iron rod and thrust it down so that I could touch her coffin. Whiles I've slept all night on her grave. I've lain there and asked God to send me to Hell at once. The grave-digger's come and found me in the morning wet through with the rain. "What are you going to do?" he asked me once. "If I wasn't afraid of the future, I'd cut my head off," I told him. Jack straightened his slightly bowed legs legacy of youthful days in the cramped workings of the coal mine - and his eyes shone with a light they did not gather from the snow. He parted his bushy moustache with the manner of a man about to make a momentous admission. `It was nothing but the grace of God,' he whispered. `Prayer, o' course. A man can't save himself,' announced Jack as he again linked arms. Before that part of the tale was through the two had arrived at a humble cottage where the miner's wife, heavy-eyed through watching and weeping, was waiting for her man, and not a little surprised to find him with a companion who was not drunk. That's how it came about that Stoker who should long ago have been at home and in bed was found sitting by a stranger's fireside, drinking hot coffee and telling an enthralled audience of two the story of the great change. Presently man and wife were kneeling at the kitchen table, and the stranger was praying earnestly while they gave a tearful assent. `Now you pray,' he suggested, but the poor fellow only cried out that he `couldn't say no prayers’. `Never mind,' said the traveler. `The night I tried first it wasn't any good, either. I went home. I didn't know what to do, and I went into the garden-house where I'd pigeons and gamecocks, and I locked the door and went on my knees and said, "Now what shall I do? Shall I pray or swear or drink or cut my throat?" A gamecock flew at me. I kicked it away twice. Then I threw it out o' the door and I cried, "O God, if You can save a wretch like me, do! Save me, or damn me!" Thus encouraged, the poor drunkard and his wife both claimed the help of God to begin a new life by His grace. 'And did it work' the newly converted drunkard asked. Meanwhile, across the hills Jack's wife was wondering why her husband had not arrived by the last train as he had intended doing. `It's funny about father,' remarked one of her sons, as the time wore on. 'Such as?' asked the boy, knowing well, as children do, what was his mother's favourite topic of conversation, and how pleasantly the time would pass if he could just get her started talking about his father. 'What was that?' the boy asked, and Mrs. Stoker told again the tale of the Northern Field Day which local Salvationists had arranged to coincide with the visit of a fair to the town. The Army procession was marching along the main thoroughfare on one side of which was a large green, covered with shows and boxing booths. 'Not if I know it!' replied Stoker, and immediately ran up the steps of a boxing booth, warmly greeting Bill Blank, champion boxer. 'Who are you?' asked Bill, uncertainly. `Me?' queried Stoker, adding rather ambiguously, `Haven't I seen you on Newcastle Moor?' `That's very likely,' admitted the boxer. The boxer went in and the crowd went in behind him: the boxer went out at the back door but the crowd had to stay. Stoker took his place on the platform and held the attention of' the multitude so completely that the fun of the fair and the disappearance of the boxer were alike wholly forgotten. `Whatever methods he adopted,' went on Mrs. Stoker. 'his purpose was always the same - to attract men and women simply that he might make them hear his message of Salvation from sin and win them to the Saviour he loves so dearly. That is why he is so successful, and that is why people really could never be offended with him. 'Good old dad!' interrupted the boy eagerly, despite the fact that he had heard the story before. 'Oh, you told me to give it to a poor man yesterday.' she had replied. 'There was the night at Hartlepool when the Treasurer was not present at the Meeting, and Stoker had had to take charge of the collection. When it came to the time for balancing accounts, however, the collection for that night was missing. 'Who had it?' asked the Captain. 'You did, John!' replied his wife. It was just the sort of thing she knew had happened, and Jane Stoker was glad to have it so. The boy was sent to bed. Tired as they were, Jack and his wife stayed talking while she inquired 'what sort of a time the dear General had had.' It was a source of pride to them that William Booth found the support of Jack Stoker, with his sympathy and earnest endeavour to get men to turn from sin, something worth having in his great Meetings up and down the country. His wife, dying of cancer in their little home, found her hours of suffering lightened by reliving the years she and her man had spent together. When first she saw him he had been in rags, standing in Blyth market place in his stockinged feet in the snow, listening to an Open Air Meeting she, as young Captain, Jane Cook, was leading. There he was without a friend and without a shilling, earning £1 a day and squandering it all in drink and gambling. They had told her something of his early life - that the home into which he had been born in 1851 was a drunkard's home; that at the age of ten he himself had been sent to work in the coalmine and was so sleepy when he came up that his mother had had to fetch him from the pithead, take him on her knee and wash him and put him to bed as though he were a baby; that there were eight other children to care for and feed, and the little chap's wages were more than ever needed in a home where father wasted most of his earnings in drink. Some despised the man for his dissolute manner of life. Others despaired of any transformation ever being effected in people so abandoned. But she had prayed and believed that such as he could be saved. She recalled how, as she spoke in the Hall, compassion had brought tears to her eyes and Stoker had asked a pigeon-flying man who sat by him what she was weeping for, and when told 'for you and me, man,' he had leapt up and cried, 'If thou'll hold with me, I'll come,' and had knelt at the Penitent Form. She remembered his struggle to find faith, and his determination to keep it. There was the day when he swore over a hurt and some one scolded him for 'breaking out.' 'Is that what you call breaking out' he asked. 'Then I'll break in right away!' and down on his knees he went at once, settling in a moment what might have led many another three week-old Convert into a distressing, purposeless muddle of mind as to what Christians meant when they talked about backsliding. In Monkwearmouth, when they heard the news, they remembered how, on the day of the stone-laying ceremony for the Army building, 3,000 people had sat down to a public tea Stoker had organized so successfully that shipyards and works had to allow a holiday for the occasion. They reminded each other of how so many drunkards had been converted as a result of this man's ministry in their midst that thirteen public houses had had to close their doors during his first three months in the town. One hundred and twenty Converts had been made on one Sunday alone. At Chester-le-Street they remembered how he arrived in the town and before he was known to anyone there had squatted down among some miners who were sitting around the pithead. 'You've some very fair dogs here,' he said. 'Can they run any?' And the men fell to talking about the prowess of their pets. Then he took them over to a temperance hotel and stood them all drinks of ginger ale. Never a word of Salvation he spoke, only dogs and ginger ale. 'Know who he was?' someone asked the men after he had gone. 'That's the new leader of the Mission.' That night the building was absolutely packed with men and their dogs, and Stoker talked to them from eight till nearly ten with never a break for singing or prayer. Before he had been in the town long, men were so anxious to kneel at the Penitent Form and confess their sins that they were leaping off the gallery to do so! In another town a man who heard the news remembered his own conversion. Irreligious and blasphemous, he had assured his Salvationist wife that he would break the neck of any Army Officer who dared to set foot in his house. But he had been helpless and surprised when Stoker, rushing in one day, stood for a moment or two in front of a cage in which a canary was singing blithely, and exclaimed enthusiastically, 'My, but yon's a bird any man could be proud of!' and then apologizing for his bad manners hurried out again. The man had fallen on his knees and sought God's forgiveness, and now, at the time of Stoker's passing, was a well-known Local Officer in The Salvation Army's ranks. At Blyth, his home-town and Corps, they remembered the young rough who became such a world-famous figure for his soul-winning successes, and found their sorrow mingled with justifiable pride in this son of their northern township. Thank God things are much better this year than last. Your own health is improved, you have got started work, and you seem to be much better in soul- more interested in the Band and Meetings . . . you ought to begin to read your Bible a little every day. If it is Just a verse it will help you to keep in touch with the Truth. No wonder his children have grown up to share his enthusiasm for trying to get people to love God. 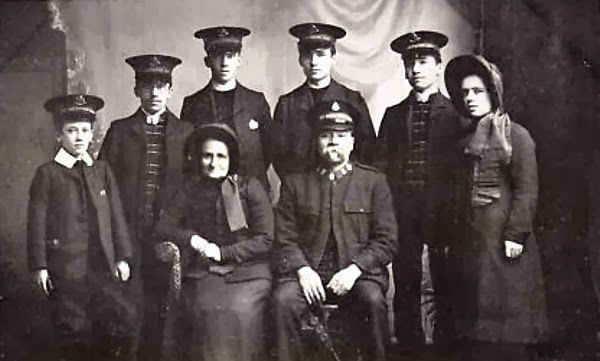 The eldest daughter and son are Salvationists in Yorkshire; another son has the oversight of a Salvation Army Young People's Corps (Sunday school) in West London; while three sons are Salvation Army Officers - one in charge of a Corps and another of a large Men's Hostel in East London. While the funeral cortege was on its wav to the cemetery through the crowd-lined streets of Leeds a man rushed out of the ranks of the onlookers. With tears in his eyes he told a Salvationist that he had ceased to be a Christian, but was so moved by Stoker's passing that he wished there and then to begin anew the Christian warfare. Meanwhile at home the widow gazed with tear-dimmed eyes down the vista of the years and saw again a poor man in stockinged feet standing in the snow-ragged, ill, dejected-and she praised God for His amazing miracle-working grace and for the share she had had in leading such a man into paths of service. Some leading members of the body calling themselves the "Salvation Army," arriving in Bristol on Saturday, commenced their campaign with a quiet service yesterday morning in the circular wooden building erected some years ago in the Backfields, behind the Full Moon Hotel, St, Paul's, by Pablo Fanque for his circus company, and now re-christened the "Salvation Circus." The contingent at present appears to be a very small one, numbering some half-a-dozen prominent brethren, who, however, were followed from St. Philip's by a considerable number of persons. There was a large attendance, and those who had come from mere curiosity did not find very much to satisfy any thirst for novelty, even "Lieutenant" Carver failing to bring his "Hallelujah cornet," as expressed to the assemblage in an apology for its being accidentally left at home. There was, therefore, no accompanying music, but the singing was led by the leaders of the army, "Capt." Taberer (who incidentally conveyed to the audience that he was formerly known as "Drunken George" before his conversion), the lady announced in the bills as "Happy Sally," another lady, Lieut. Carver, and Brothers Shrewd, Joseph, and Brain, of Newport. These, with two children, occupied prominent seats on one side of the circus, and the assemblage took the rows of seats around the building and the sittings specially arranged across the circus ring, Hymns from the "Salvation Song-book," by Wm. Smith, and set to popular tunes, were sung, the last lines being repeated again and again as a refrain or chorus. After the singing, "Capt." Taberer read a portion of Scripture, freely commenting upon it as he read, and also giving scraps of information, amongst which was the fact that they sometimes had two speakers, sometimes five, ten, twenty, or one hundred at one meeting. Sighting some persons at the door-way, he told them they would not be allowed to stand there. There was plenty of room inside, and they intended to begin as they would go on. Brother Smith, who said he had come from Newport, gave a short address, and in the course of an appeal to well-deserving sinners, he referred to St. Paul's captivity, but did not know when he was dragged through the streets whether he had an umbrella. "Captain" Taberer thanked God that he had one. Brother Smith, continuing, said that the Christian’s life was a life that devils looked at and trembled. Remarking that they were a rough lot, without learnedly written sermons, be said they had not been to college — but they had been to Calvary. "Captain" Taberer, continuing his running comments, said at Hull, where they had been, there was a publican who, next door to them, used to sell eight barrels of beer is week, but when they left he only sold three. They could not help that, and if that man wanted some work to do he could find some for him — to sweep up the Salvation circus. He further explained that they always closed the service at twelve o'clock, so that people might have time to go home to dinner — if they had any — and come back again. If they had no dinner, he would be happy for them to go home with him, and he would divide his own among them. The remark elicited applause, which the speaker deprecated, as that was now the House of God, and what used to be done when the horses ran round there could not be done now. It took his mind back to the time of the public house, the singing room, and the concert hall. He and his wife had some difficulty in getting lodgings in Bristol, but they had taken an empty house, where they only had two chairs for themselves and one for a brother, and if anyone would come home to dinner with them he would sit on the floor. After singing a hymn to the stirring tune of "Hold the Fort," “Lieut." Carver next spoke, and informing the assemblage that he was no preacher, he said whenever he took a text he generally left it, and "it was ten to one he never got near it again." The Salvation Army was going on; it had been stoned, kicked, and hooted, and some of the members of it had been put in prison, but it would continue to grow. Their object was to make an onslaught upon the devil and sin, and they hoped to have a hundred houses of prayer in Bristol before long, in homes that were now as black and filthy as hell could make them. "Capt." Taberer said he had been asked how long the Salvation Army were going to stay here, but he would say that when he left there would be someone else to carry on the work; in fact, they would stay there till the Lord burnt Bristol down, as He would one clay. There was another service in the afternoon, and an Open-air meeting in the Horsefair, at which the proceedings were not unmixed with levity, but there was no actual disturbance. The leaders followed by a large crowd walked to the Circus for the evening proceedings, at the opening of which there was considerable shouting, clapping of hands, laughter, and hissing, which the promoters of the gathering suppressed, and they also induced several persons entering the place with their hats on to uncover. About 2,000 persons assembled, and the ingress and exit of many persons, with stamping etc. proved a disturbing element. The hymns, to secular tunes, with refrain or chorus, proved something more than quaint, and provoked laughter, which there was some difficulty in suppressing. While a brother was giving out one verse someone in the audience attempted a line of the chorus, but the "Captain" reminded the audience that they could not do it, and they must listen to the leaders first. In the course of his remarks he said they had not got a banner or many soldiers yet, but they expected to have some before a month was over. Several persons, including the lady styled "Happy Sally," spoke, their vehement appeals and demonstrative gesticulations now and then provoking ridicule. Two of the company sang a duet, and during the proceedings six or seven persons went round the audience with collecting boxes. This report of The Salvation Army opening fire in Bristol was published in the Bristol Mercury, 23rd August 1880. While rumour has it that some of our actor-managers are to be knighted, an actress has been righted, for Miss Ada Ward has become a Salvation lass. Miss Ward has had a varied career. She has been on the stage for twenty years, having played with Modjeska and as leading lady of the Theatre Royal, Melbourne. Indeed, she has been four times around the world in that time. 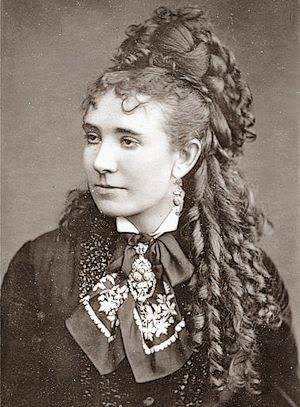 She has also been twice married, divorcing her first husband in her seventeenth year; and she served as a nurse during the Siege of Paris, writing a magazine article about her experiences thereat. Recently she has been playing in Portsmouth as Lady Isabel in “East Lynne”, and in “The Forger’s Wife”. The Sketch. March 10th 1887.